Yesterday was Commencement, and it was a terrific one. There had been some reports of potentially bad weather a few days ago, and we may have even had a little rain late Sunday night/early Monday morning, but the day broke with beautiful purple skies and it turned into a sunny and glorious day – if a bit warm. The Quad opened at 6 am yesterday, and there were families there from the very earliest time they could enter campus. Those first parents arrived just as the dawn was breaking, and they had the opportunity to find their perfect seats, grab a cup of coffee, and enjoy the calm of the early morning. They also got to watch the flurry of WFU staff as we all took care of our particular jobs. There started to be more traffic in the 7:30 timeframe. Closer to 8:00 you’d begin to see students coming to find their parents, take pictures, and look with excitement at the pomp and circumstance that was about to begin. About 8:45, a University representative encouraged everyone to find their seats, and there was palpable excitement because you knew things were ready to begin. The Carillon bells rang and the ceremony was underway at 9:00. An academic processional is always a fun ceremony to see. Each professor’s robes and mortar board represent the school from which the graduate degree was awarded. Many of them are brightly colored (either the gown or the stripes on the sleeves). Some of the robes are puffy with Henry VIII type hats, some are more austere black. After the platform party of faculty and Trustees, the students arrived and filed neatly into their assigned seats. I saw some students with flowers, or black and gold leis. Many wore sunglasses, and it was a good thing – it was hot and sunny. Finally, the president and speakers arrived. 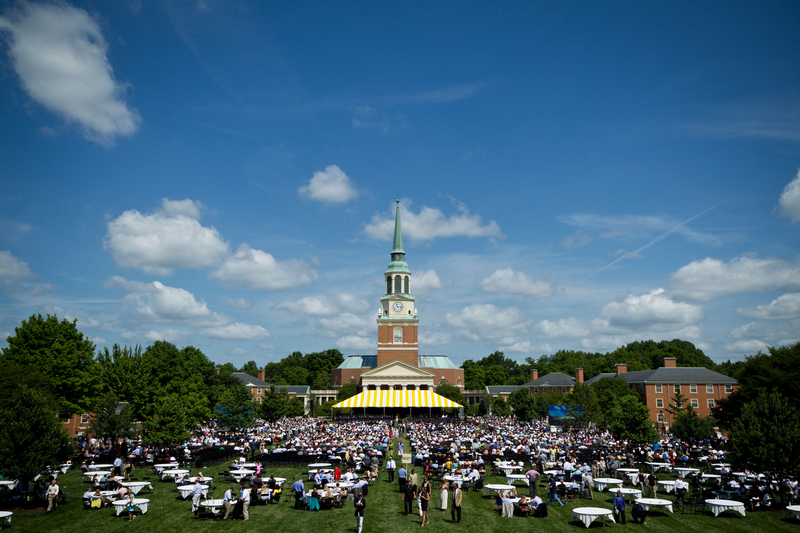 Wake Forest has a dedicated web site that is running stories and videos and photos about Commencement, and I encourage you to look there for a wide range of good content. In particular, I recommend to you Dr. Hatch’s speech to the graduates, which urged them to nurture the art of real conversation (truly a lost art in my opinion). Charlie Ergen (MBA ’76), was the Commencement speaker. He is the chairman of satellite broadcaster DISH Network Corporation and EchoStar Communications Corporation, but on this day he was also a father to daughter Kerry (’12). His speech, which you can read here, was peppered with fatherly advice and references to Dr. Seuss, was brief and light. 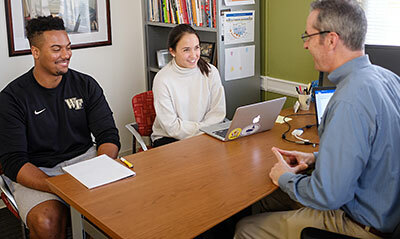 There is a terrific story on the WFU website about his speech; read it here. After Mr. Ergen’s speech, honorary degrees were conferred by the various schools of the University, Dr. Hatch made his remarks, and retiring faculty were recognized. 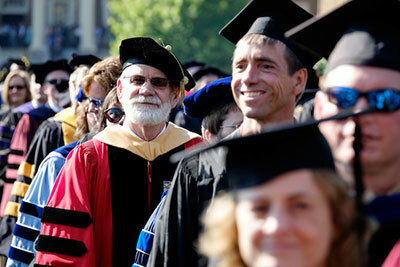 Then the graduate students’ degrees were conferred and they moved to their respective ceremonies with their families. A 15 or so minute break was called to let the graduate students and families depart, and then the ceremony for undergraduates resumed. During the break, people circled the Quad in search of restrooms, coffee, or more likely cold drinks. Some of the families had moved their chairs closer to the residence halls to get a bit of shade. It was quite hot in the sun. Each graduate then passed across the stage to hear his/her name called, to shake hands and receive his/her diploma cover (actual diplomas are mailed to the student later). It is a wonderful thing to hear the names called – because you can see parents and siblings and grandparents standing up with pride, taking pictures, and cheering. Every so often a loud and proud group would all cheer in unison for their student, and at one point there was even an air horn (mercifully briefly). When some of our higher profile student-athletes graduated, there were great cheers from the audience. I was briefly standing near the very tall brother of our basketball player, Nikita Mescheriakov, and we chatted for a bit. His brother told me his mother had been able to make the trip to see him graduate; I assume he had meant she came from their home in Belarus. He could not have been a nicer guy. At the end of the ceremony was the commissioning of the ROTC cadets, now officers in the Army. It’s always one of the very proud moments in the ceremony. Sobering, too, because you know these young men – who have been on our campus as residents and students – could now be sent anywhere in the world with the Army. The applause for these newest soldiers is always very generous. At the end of the service, after the benediction, is the recessional. The platform party comes off stage down the Quad toward Reynolda, and the faculty always stop toward the end of the Quad and line up so they can shake hands with the graduates. The students stop, hug or shake hands with those faculty they know, and walk to the end of the Quad and wait to find family and friends. My colleagues and I always watch the line walk from the balcony of Reynolda. It’s the best viewing, and you witness so many happy and tender moments. Hugs. Tears. Kisses. Family photos. Sheer joy. I say this every year: Commencement is the best day on campus. There is so much joy, and pride, and excitement, and happy tears. 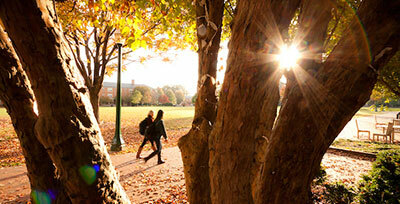 And with such pretty weather, students and families will remember this for a long time. Congratulations, Class of 2012. Go forth, and live lives of meaning and purpose. 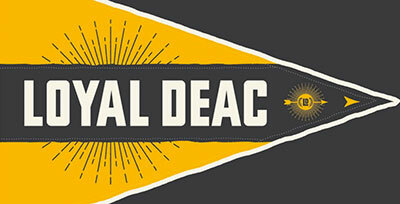 Do well, and do good, in the spirit of Pro Humanitate. And come back often and visit Mother So Dear. You will always have a home here.